FoldAMount 68 Victory by First Team, Inc.
SIDE FOLDING, NBA REGULATION WALL MOUNT SYSTEM WITH 1/2" THICK GLASS BACKBOARD. Institutional Grade! Side Folding for Multi-Purpose Courts. 6' to 8' Wall to Backboard Extension. 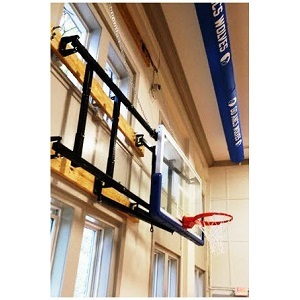 This system has a regulation NBA backboard and rim and is perfect for any gym's main court, side court or your home gym. The 1/2" thick glass backboard is the same as used in NBA arenas. Package Includes FREE TuffGuard molded bolt on backboard padding in your choice of 16 colors. Model FT72C ($170.00 value. select above). You can add height adjuster if you want to be able to lower the rim to 8'. Model FT310 (select above). Shop around and compare these features. 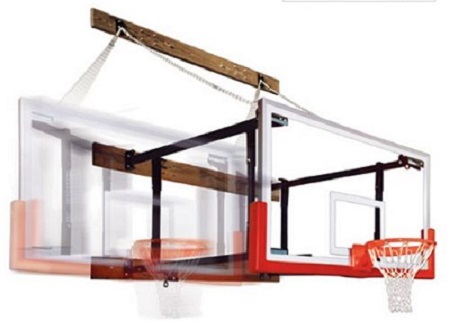 MOUNTING STRUCTURE: Unique TELESCOPING design allows the backboard to be mounted anywhere from 72" to 96" from the wall. No tube cutting required. Side folding design allows the backboard to be stored against the wall to use the court for volleyball etc. 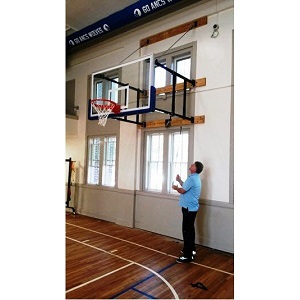 Backboard can be folded left or right for storage against the wall with no need for tools or ladders. Square tubing is used to eliminate the sway caused by systems that use round tubing plus it looks much nicer. Other sizes of 48" to 72 and 96" to 144" are also available (see Wall Mount page for other sizes). 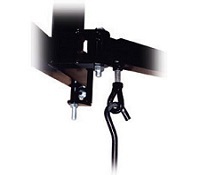 The structure can be mounted to most wall types using 3 load spreading hardwood wall struts. The wall struts are included. Please call us if you have any mounting questions. Includes crank handle. No ladders needed to fold the system for storage. MOUNTING STRUCTURE: FT2030 - Side Folding. Heavy Square Steel Tubing Powdered Coated Black. EXTENSION: 6' to 8' Wall to Backboard. Telescoping. SYSTEM WEIGHT: 597 lbs. (shipping weight: 607 lbs. ).